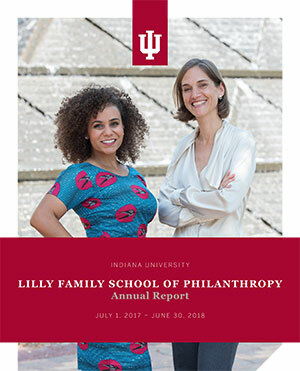 The Lilly Family School of Philanthropy helps students, nonprofit professionals, volunteers and donors become innovators and leaders changing the lives of others for the better. During the past year, we’ve created additional opportunities for you to gain the knowledge and skills you need to create positive and lasting change in the world. Developing Innovators and Leaders. Philanthropy and nonprofit organizations are growing in importance in all sectors of society. They operate in an environment that’s more complex than ever, requiring more sophisticated education, research and training. The school is in the forefront of meeting those needs. We are preparing current and aspiring philanthropy professionals with the knowledge to be thoughtful, innovative leaders. We recognize our generous donors and critical partners. See who is serving on our Board of Visitors. Also, read and explore our detailed financial report for the previous fiscal years.